Three cheers! Animation on our rocking new video “He’s Barack Obama” has wrapped and as we render, burn DVDs for the press and catch up on sleep before the June 19th premiere, celebrations have commenced with a special surprise! 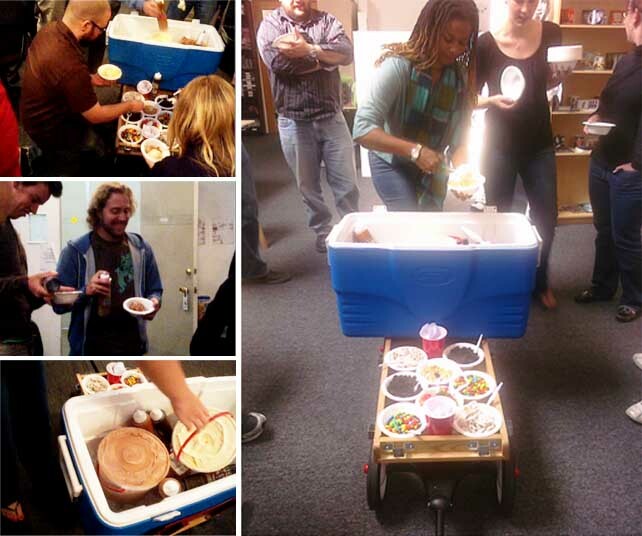 Our trusty treat wagon rolled into the office as it does every Wednesday, this time loaded with a boatload of ice cream and a bevy of toppings! Ice cream sundaes for everyone, huzzah! This entry was written by paulhanges and posted on June 10, 2009 at 6:23 pm and filed under Inside JibJab with tags wagon wednesday. Bookmark the permalink. Follow any comments here with the RSS feed for this post. Trackbacks are closed, but you can post a comment. I just have to say…that wagon RULES!! !